Providing you the best range of cut section of diesel fuel pump and actual cut section model for automobile industry with effective & timely delivery. 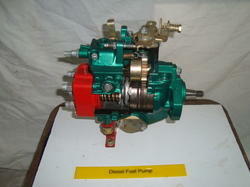 The working of diesel fuel pump is shown with the help of actual parts assembled on iron base. All the necessary parts of diesel fuel pump are shown in actual working form. This model helps the student to understand the working of the diesel fuel pump very easily. It is specially made dissectible for demonstration purposes. We are offering Actual Cut Section Model for Automobile Industry to the prestigious clients. Our dedicated and knowledgeable professionals manufacture this section model using best quality components and advanced technology in synchronization with set industrial norms. Looking for Actual Cut Section Model for Automobile Industry ?